When it comes to snobbery, Hyacinth Bucket is in a class of her own. Hyacinth Bucket (pronounced "bouquet") goes to incredible lengths in her quest for perfection. Hers is a spick-and-span house. Her downtrodden husband, Richard (Clive Swift), acts as chauffeur in their immaculately kept car. Their permanently absent son has a superior name, Sheridan. Even the empty milk bottles sparkle on the doorstep after their obligatory rinse in the dishwasher. Hyacinth delights in her "candlelit suppers", but her guests live in fear of receiving her invitations. Next-door neighbor Liz (Josephine Tewson) is so nervous that she is guaranteed to break or spill something. Her brother Emmet (David Griffin) hides every time he sees Hyacinth. And the Buckets' distinguished friend, the Major (Peter Cellier), and the vicar and his wife all do their best to keep out of her way. In marked contrast to Hyacinth's meticulously ordered life, however, the rest of her family are as common as muck. They live together in a rundown house that looks like a junkyard. 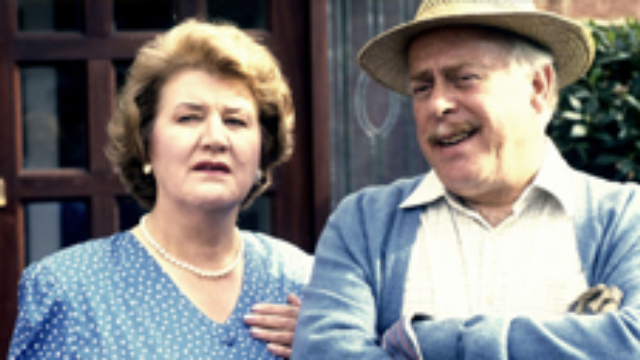 Sister Daisy (Judy Cornwell) and her husband, Onslow (Geoffrey Hughes), are out-and-out slobs. Her other sister, Rose (Shirley Stelfox), is an aging tart. And her elderly father is a lecherous drunk, given to cycling stark-naked down by the canal, chasing the milkwoman. Whatever Hyacinth does, her family can always be guaranteed to show her up. Can she ever live down the disgrace? Find Keeping Up Appearances on WMHT TV.